In this article, we will install Linux Mint 19.1 on the virtual machine using VMware Workstation 15.0.4 virtualization program. You can install the Linux Mint operating system on both your physical computer and the virtual machine. You can install and use the Mint operating system on your computer with virtualization programs such as VMware, VirtualBox or Hyper-V. You can also download the latest version of Mint from here. In the previous article, we installed the Mint 18.3 operating system with Oracle VM VirtualBox. You can reach this article from the link below. In this article, we will create a new VM using the VMware Workstation 15 Pro virtualization program developed by VMware, and then setup Linux Mint 19.1 / 18. You can also browse the VMware Workstation installation on Windows 10. The latest version of the Mint operating system is 19.1 Tessa. To install Linux Mint 19.1, first install VMware Workstation 15 on your Windows 10 computer. After you setup the latest version of VMware Workstation 15 Pro (15.0.2), you can now proceed to the Linux Mint installation steps after creating a new VM. To setup Mint’s latest version 19.1 on VMware Workstation 15, follow the instructions below. Open the VMware Workstation 15 virtualization program and click Create a New VM. In the New VM Wizard window, select Custom (Advanced) and click Next. To setup Linux Mint, set VMware hardware compatibility to Workstation 15.x and click Next. To add the ISO file to the VM at a later time, check I will install the operating system later and click Next. Select the operating system you will setup in the Select a Guest Operating System window. Select Linux as the following image, then select Ubuntu 64-bit for installation and click Next. Type Linux Mint 19.1 for the VM name. You can also configure the installation location of your virtual machine as your External HDD by clicking the Browse button because it is useful to store the VM on a different disk. Depending on your computer’s hardware performance, you can configure 2 CPUs and 2 cores to make Linux Mint faster on VMware. You can change the values ​​here as you like. After configuring the processor settings for the virtual machine, click Next to continue. Add 4 GB RAM to the virtual machine. Select NAT for VMware network configuration and click Next. Leave the LSI Logic option enabled by default for the SCSI Controller and click Next. Select SCSI as the disk type you will create and click Next. To create a new virtual disk, select Create a new virtual disk and click Next. For Mint installation on VMware, 25 GB virtual disk size will be sufficient. In order to use the virtual machine more efficiently, select the Allocate all disk space now option and select Store virtual disk as a single file and click Next to continue. Leave the location where the virtual disk file will be saved by default and click Next. After you create a new virtual machine, you need to make some necessary adjustments. To do this, click the Customize Hardware button. Click Processors, then select Virtualize Intel VT-x/EPT or AMD-V/RVI on the right side. Click on the CD/DVD device and select Use ISO image file and click Browse button and add the ISO file to virtual machine. Before adding the ISO file to the virtual machine, be sure to perform the Linux Mint ISO verification. Now select the installation image file and click the Open button. After the necessary adjustments, click the Close button to close the window. After preparing the virtual machine, click Finish. Wait while the virtual disk is being created. Finally, you must start the virtual machine on VMware and complete the installation. Click Power on this virtual machine. To install Linux Mint 19.1, you can complete the stages below by clicking the image below. Follow the stages below for installing Mint using VMware Workstation. After setting up VMware Workstation 14.1.1 Pro, run the VMware virtualization program and then click on Create a New Virtual Machine to create a new virtual machine for Mint 18.3 Sylvia. In the New Virtual Machine Wizard window, select Custom (Advanced) and click the Next button. In the VMware hardware compatibility window, make sure that Workstation 14.x is selected, then click Next. In the Guest Operating System window, select the I will install the operating system later option and click Next to add the ISO file at a later time. In the Select a Guest Operating System window, select Linux as below and in the Version area select Ubuntu 64-bit and click Next. In a virtual machine setup with VMware, storing the VM on an external disk will be beneficial in terms of performance. Type a name for the VM and store the location on the Portable HDD. Once you have located the machine, click Next to continue. If you are going to run a single machine on VMware and your computer is highly featured, you can define two processors or a dual core processor in the Processor Configuration window. For Mint 18.3 setup on VMware Workstation 14, 2 processors will suffice. After configuring the processor, click on the Next button. Assign a 4 GB (4096) RAM value for the VM and click on the Next button. Select NAT for network configuration and click Next to continue. You can also browse our article called VMware NAT Configuration. Select LSI Logic (Recommended) and click on the Next button. To create a new virtual hard disk for Mint 18.3 setup on VMware Workstation 14, select Create a new virtual disk and click Next. You can change the recommended disk size for the VM. You need to configure the HDD space to allocate for the machine performance by selecting Allocate all disk space now and Store virtual disk as a single file. After configuring the virtual hard disk settings, click on the Next button and wait for the virtual HDD to be created. Leave the location of the virtual HDD to be created as default and click on the Next button. The following image contains VM summary information for setting up Mint on VMware Workstation 14. If you want to add new hardware or delete existing hardware, click the Customize Hardware button. Open the Mint 18.3 virtual machine hardware configuration on VMware and select Virtualize Intel VT-x/EPT or AMD-V/RVI from the Processors section and click the Close button to save the settings. Click the Finish button to close the Linux virtual machine summary window. Wait while the hard disk is creating for the Linux virtual machine. Click on CD/DVD (SATA) to add the Linux 18.3 Sylvia ISO file to the virtual machine. Click on the Browse button to add the ISO file from the Linux 18.3 virtual machine settings window, select the ISO file and click on the OK button. To start the installation with VMware, click on Power on this virtual machine. In the Welcome to Linux Mint 18.3 Cinnamon 64-bit Boot screen, press Enter on Start Linux Mint. Once you have the Linux Mint open, double-click on Install Linux Mint. Make your Mint operating system language setting and click the Continue button. If you want to setup third-party applications, you need to select Install third-party software… In this article, we will not setup 3rd party applications because we will use Linux Mint as a VM. Click on the Continue button to continue the installation. We will select Erase disk and install Linux Mint option because we will use the Mint on a single HDD. Click the Install Now button. Click the Continue button to write the changes to the disk. Select the region you live in and click Continue. Configure your keyboard layout and then click the Continue button. You need to create a new user for the VM. After defining a new user, click the Continue button. Wait while installing a Linux virtual machine on VMware Workstation 14. Once you have successfully installed Linux Mint on VMware, click Restart Now. Press Enter to remove the setup media. Type your username and password that you created. 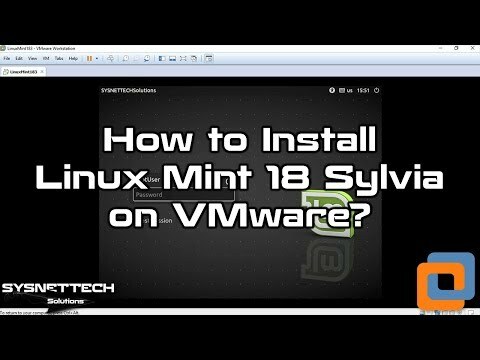 We have successfully completed the Mint 18.3 Sylvia installation using VMware Workstation 14 on Windows 10! Mint 19 was named as “Tara“. Mint 19 will receive Security Updates until 19, 2023. To download the ISO file, visit https://linuxmint.com/download.php. 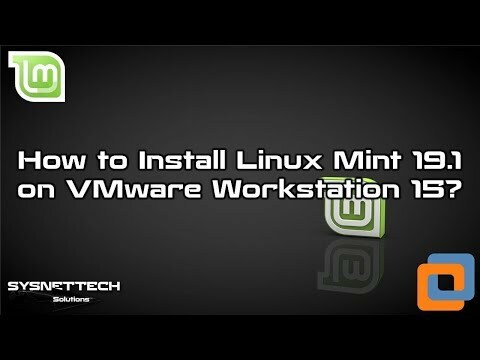 After downloading the Linux Mint 19 Tara ISO file to your computer, you can setup Linux 19 using VMware Workstation 14 on Windows 10 operating system. 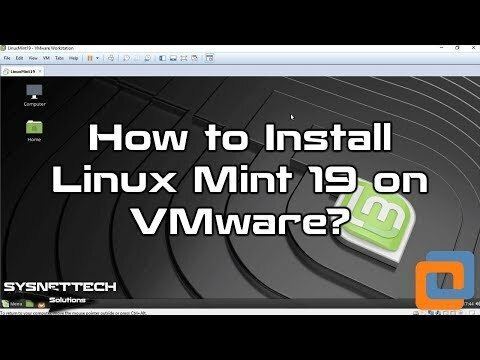 To install Mint’s version 19 on VMware Workstation 14, you can watch the following video! In this article, we have implemented the Linux Mint’s setup with the VMware Workstation virtualization program. In our next article, we will examine how to do file exchange between our physical computer and the VM by installing VMware Tools for Mint. Thanks for following us!